This is a great set. My son is always washing his car. 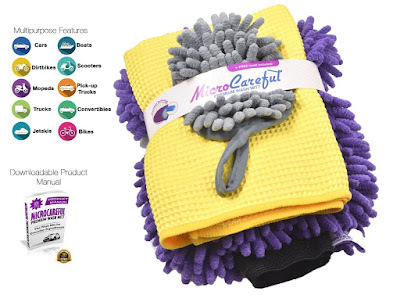 The Chemille mitt is perfect for washing your entire car and easily rinses out and dries back into its original shape. The finger mitt is great to get into small places to wash where you cannot normally clean. It also comes with a Premium Waffle Weave Microfiber Dry Towel (15"x19"). It is good because it dries the car quicker than with a regular towel. It can be used on furniture, boats any big items that need a good cleaning and you do not have to worry about the surface being scratched. Fits perfectly over your hand and much easier to wash any surface because you have more control than a regular rag. I received this great set complimentary in exchange for my unbiased review and opinion. All opinions and words are my own.